The building now housing the Popcorn Shop was constructed in 1875 adjoining the hydro-powered flour mill to showcase “The Pride of the Falls” grocery items. It was complete with a water-wheel driven gristmill powered by the Chagrin River. Reportedly it was also a "Safe House" in the Underground Railroad for liberated slaves seeking safety in the North. 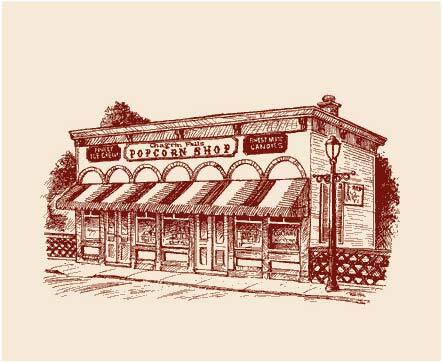 In 1949, Dorothy McClennan opened it as the Popcorn Shop, where for more than half a century it became a signature stop during walks through town. In 2000, an out of control van slammed into the shop, almost sending it down river. This unfortunate incident required significant investment for a restoration of not only the shop, but reconstruction of the foundation that clings to the edge of the waterfalls, in 2001. We added our second Popcorn Shop in Shaker Square in 2005, making our popcorn, coffee and sweets a fixture for city commuters taking the rapid downtown each morning. We are honored to keep the local tradition alive by serving the finest & freshest, locally made ice cream, Euclid Beach custard, locally roasted coffee and old fashioned candies . Our delicious popcorn that is carefully crafted locally in small batches with only the finest ingredients remains the foundation of our tradition. NOT ABLE TO STOP IN TO SEE US? 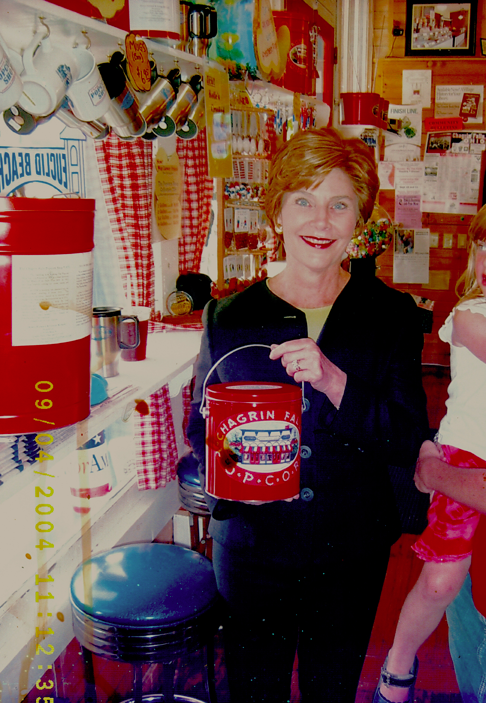 In September of 2004, the Popcorn Shop received some very special visitors. On a stop during his re-election campaign, President George W. Bush, the first lady, Laura and their two daughters, Jenna and Barbara had a taste for something sweet while visiting the important voters of Northeast Ohio. Together they enjoyed some ice cream, and the First Lady purchased several tins of popcorn. The President graciously posed for photos with the Popcorn Shop’s teenage staff and chatted with the owners while the children taste tested the flavors. To the best of our knowledge, the White House kitchen has never successfully recreated our carefully crafted recipes!